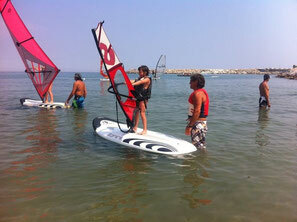 Windsurf - Benvenuti su surfstar! You've never been on a surfboard? You've already learned the first steps and you’re urging for more? You’re advanced and want to learn new maneuvers? Windsurfing is a sport of quick progress and with guaranteed fun! Our courses and our materials are suited for all skill levels and our VDWS and FIV licensed teachers adapt teaching content to your own level. 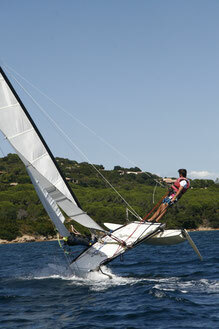 Our beginner courses include theoretical foundations, first tries on the simulator and then practice on the water. Lightweight material and qualified teachers (VDWS / FIV) guarantee you a fast progression! When you reach this level the true "windsurf fun" will begin! At medium to high winds the basic maneuvers and the correct body position on the board at higher speeds are to be perfected. In addition, the use of harness and foot straps and learning the plane. From this point on, all the doors are open! Perfection of planing and foot control. This course is for children under 11 years. While playing a first awareness of the watersport is created and the first steps of windsurfing be learned with lighter equipment. 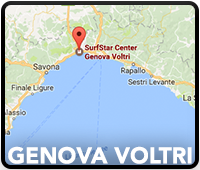 In all of our courses there is the possibility to do the VDWS basic certificate examination and earn your own Surf license! Lust for kiting? 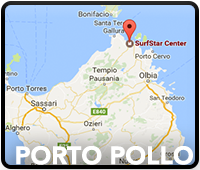 Then visit us during Easter and autumn at Porto Pollo. 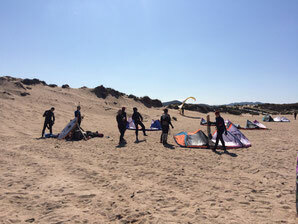 Due to the crowded Kitezone during the season we chose to offer two intensive periods during the low season. 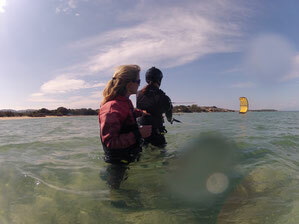 Here you can enjoy empty beaches, constant winds and dedicate yourself completely to the kitesurfing! You can participate in our "all-inclusive Camp" or book your own residence. You are already able to kite and just need some security and someone who is there for you with a few tips and tricks? With "assisted kiting" one of our coaches helps you during takeoff and landing of the kite and is there for you from land with advice and practical help to intensify your skills. You get more joy out of sailing or would just like to try it? 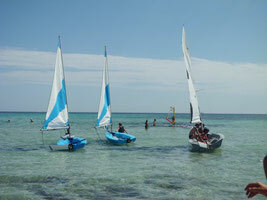 You already sail dinghies and feel like trying the catamaran? Our sailing courses are for beginners, intermediate and experienced users. You will sail with just the teacher or in small groups of up to 4 people depending on the type of boat. 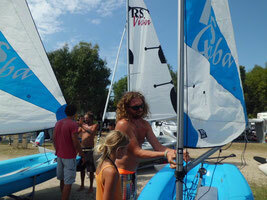 Our boats: Hobie Cat 15 , RS Vision and RS Quba are easy to handle and guarantee a lot of fun and speed on the water. You're better without sails on the water or looking for a fun activity to do on a windless day ? 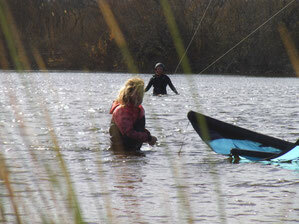 Stand Up Paddeling is a sport which provides a lot of joy on the water in light winds. 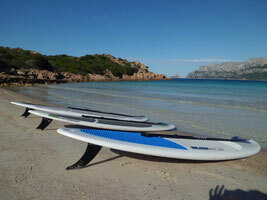 With board and paddle you can explore near bays and deserted. But even with a lot of wind and waves, this sport is a fun alternative. The level of effort and the degree of difficulty can be freely determined: from powerful and fast to cozy and quiet. 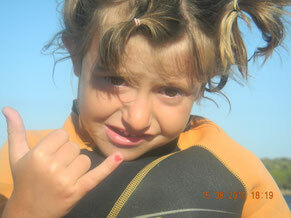 SUP is a great experience for everyone and do not forget, an ideal training for the entire body!